Who doesn’t dream of having the perfect smile? However, a lot of us don’t want to go through the trouble of getting braces to achieve our dream smile. Fortunately, Invisalign clear aligners give you the option to get straight teeth without the hassle of braces! Braces are still used to straighten teeth, but they are not the only option for patients. Braces use brackets with wires connecting them. These wires are made to move the teeth slowly in one direction as they guide the teeth to a more even position. The brackets come in clear plastic or metal materials, and have bands that come in a variety of colors. But, unfortunately, braces are limiting to what a patient can eat, and they can be uncomfortable and not very aesthetically-pleasing. Invisalign offers a great solution to these problems. They work in similar fashion as traditional braces, but they are removable and transparent, making it a virtually invisible treatment option for people who want to keep their dental treatment on the down-low. Invisalign aligners are custom-made retainers that change the position of the teeth over time. They serve the purpose of braces, but they are clear and don’t have the same restrictions as braces do with their brackets and wires. Why would I choose Invisalign? Apart from their convenience and invisibility, there are still even more reasons as to why they may be the perfect option for you. Below are many benefits to Invisalign that demonstrate why so many people love this treatment option. Many of us hate the look of traditional braces, and feel uncomfortable getting them, especially as an adult. 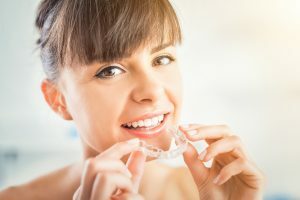 Invisalign offers a great way to feel confident showing off your smile, while striving to perfect your teeth and bite. Invisalign aligners offer fantastic results, as good as traditional braces. Overbites, underbites, gaps, and overcrowding can all be fixed with Invisalign. During this treatment, you will be fitted with several different invisible retainers that make tiny adjustments to the position of your tooth over time. These aligners are made from a plastic material, and they fit perfectly over the teeth. There are some things that you cannot eat when you have braces. You have to avoid eating certain sweets, popcorn, raw carrots, apples, bagels, etc. With Invisalign aligners, you will bypass these restrictions because you can remove them when you are eating and indulge in anything you want! Invisalign is also a cost-effective way to straighten your teeth. You can get them directly through your dental office, so you already know if your dentist takes your insurance and can work with them to find out how much coverage you have or a payment plan that works for you. Some dentists and orthodontists even offer monthly payments to make the treatment affordable and convenient. The Invisalign treatment takes 12 months on average depending on the condition of the teeth that need to be moved. Your follow-up visits to your dentist along the way are usually very short, about every 6 weeks or so. This allows your dentist to make recommendations and check your progress to ensure your teeth are moving together correctly. This is probably one of the main factors as to why Invisalign is the preferred treatment by most people over traditional braces. Not only do they give you the great results you are looking for, but they are also almost invisible! People will barely notice you’re wearing them, and you are able to remove them at any time to fit your lifestyle. This aligner doesn’t only help you feel confident smiling, but it also works to improve your health. When your bite is corrected, you can relieve jaw and joint pain, headache pain, and improve how you chew to better your overall health. If you grind your teeth, it can make your muscles sore and cause other dental problems. The treatment for this is usually a custom mouthguard. However, wearing Invisalign aligners will also help protect you from grinding your teeth because of the protective layer between the teeth. When you have traditional braces, there are a lot of hard-to-reach places to brush and floss to keep your teeth clean. On the other hand, with Invisalign, you can remove your aligners and you can brush and floss your teeth easily without barriers. Not to mention, that when you have crooked or cluttered teeth, it is more difficult to clean them and bacteria can grow with ease. Once the aligners straighten your teeth, it will be easier to clean them and ensure you don’t have plaque or tartar build up. It is possible to get teeth discoloration when you have other dental treatments like braces. This can occur when the patient is eating sugary foods or drinks that leave stains, such as coffee, tea, wine, etc., and not taking time to clean all the nooks and crannies of his or her braces. Although you can still get teeth discoloration without braces, your chances are lower with Invisalign, as you can take out your clear aligners at any time and easily brush or floss each area of your teeth. To be successful with this treatment, you need to wear them at least between 20 to 22 hours a day. This means that you need to wear them all day and night with the exception of removing them when you are eating or brushing your teeth. This ensures that your teeth are moving in the right direction and not reverting back to their original state. After your Invisalign treatment has been completed, you risk the teeth returning to their original form. To counter this, your dentist can offer you a retainer to wear at night to ensure that you maintain your beautiful new smile. There is a lot that Invisalign offers our patients and reasons why we think it’s a great treatment option! For more information on how you can get started with Invisalign today, contact 5 Points Advanced Dentistry at 614-961-4351. You can also visit the office at 3380 Tremont Rd, Upper Arlington, Ohio 43221 or go to our website to find out more about our services!